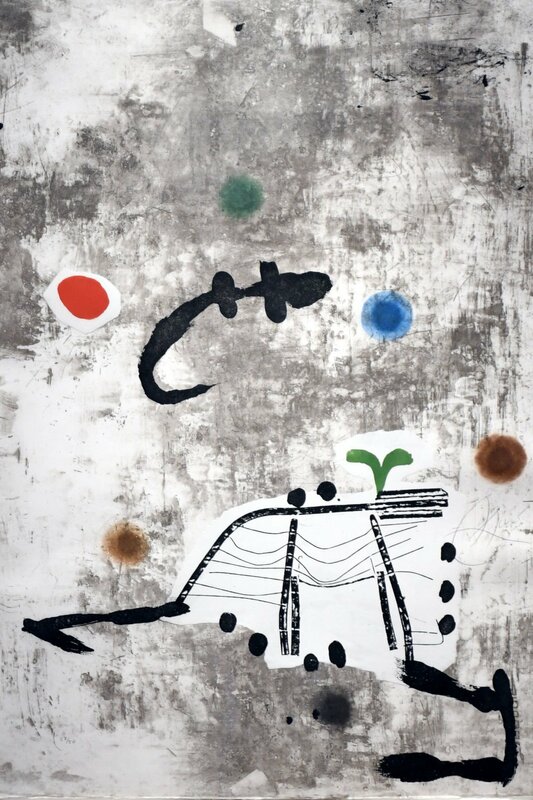 Joan Miró, Spanish 1893-1983: “Personage I Estels #55,” 1979, color aquatint, woodcut on paper. Entrance to the “50/50” gallery show. “Suit of Ceremonial Armor,” Japanese Edo Period (1603-1868),18th-19th century iron, leather, gilded wood, gilded bronze, silver and hair. William King, American,1925-2015: “Visitor,” 1975, burlap over steel armature. Critic B. Amore speaks with Richard Saunders, director of the Middlebury College Museum of Art: I see that the museum is sponsoring “50/50: Collecting for the Middlebury Museum of Art,” which accompanies the “Modern and Contemporary Works from the Permanent Collection” which I just reviewed. The two exhibits together are quite impressive, and I’d like to ask you a few questions about the Middlebury College Museum collection. How long have you been the director, and what are some of most satisfying and challenging aspects of your tenure here? Saunders: I came to Middlebury in 1985 because there was a plan to expand the existing art facilities. In 1992 we opened our present museum. It has been enormously satisfying to be at an institution with such wonderful colleagues and students. And, as I like to write and teach, as well as administer the museum, both have been possible here. Often, once a director starts to climb the ladder to larger museums, writing and teaching tend to diminish or disappear, as institutional priorities change. One of the most satisfying challenges I have found at Middlebury is expanding our permanent collection in meaningful ways. Our highest priority is to make acquisitions that will be welcomed by faculty colleagues and enhance the academic program. This is a team effort and together, with our museum curators and interested faculty, we have made numerous important acquisitions. We have also been blessed by wonderful gifts from Middlebury alumni and friends. Amore: What is the role of a university museum, and how do you see the Middlebury College Museum’s unique offerings to the Vermont arts community? Saunders: Our museum exists primarily to serve the academic program, but also to be a cultural resource for the larger Middlebury community and the region. Many of our activities during the academic year relate directly or indirectly to our students. There are many ways for students to engage the museum: through courses, as interns, as members of our Museum Ambassadors Program, or socially through our Student Friends of the Art Museum. Because Vermont is such a rural state, it depends more readily on institutions like our museum to play a cultural role disproportionate to our size. We welcome anyone and everyone, and best of all — it is free. There is no admission charge. Amore: Can you speak to the range of the permanent collection — how many pieces are there? I understand that there is a handbook to the collection that will be published this year. Will this be available for purchase? Saunders: Our collection consists of approximately 6,000 objects and they range from objects from ancient Assyria, Egypt, Greece and Rome to contemporary works created in the last year. One of my favorite pieces is the recent acquisition of a Kongo Power Figure, carved in the 19th century in the central African region of the Republic of the Congo. It went on view for the first time a few weeks ago. For the past two years we have been working on a handbook of the collection. It will feature about 200 works that represent the breadth and depth of our collection, and each featured work will be illustrated and accompanied by a short text about it. Our hope is to publish the handbook later this year. Amore: Could you share how works are acquired? What is the relationship to donors? How is the museum able to create such a world-class selection of art? Saunders: We acquire works in several different ways. We always welcome gifts that complement what is already here and that will be used in conjunction with the academic program. Over the years many people, some of them Middlebury alumni, but others people who believe in what we are trying to do, have made significant gifts to enhance our collection. In addition, we purchase works from art dealers, through auction houses and from private collectors. These purchases are made possible with the income generated by endowment funds dedicated exclusively for the purchase of works to expand our permanent collection. Each of these endowment funds were gifts from alumni and friends. And lastly, one unusual program we have is to take most of the funds generated annually by memberships in the museum (http://museum.middlebury.edu/support) and fund an annual acquisition, voted on by the museum membership. This is not only great fun, but also has been a means through which a number of important works have been added to our collection. Amore: How is the collection used by students and the public? Is there free access to exhibits? Saunders: On most days during the academic year you will find students in the museum. In some cases, they are here for a discussion section, which is part of a course in which they are enrolled. On other occasions they are here on their own working on a paper or presentation in conjunction with a class. Faculty may also request that works not on view be assembled in a museum study space where they can be examined more closely. Some students become members of our Museum Ambassadors Program, which is overseen by our curator of education and academic outreach. Through this program students spend one afternoon a week at the museum honing their skills at giving tours to elementary and secondary school students in the region. These programs are offered free to interested teachers who bring their students to Middlebury. Other students work for us as paid interns during the academic year, or during the summer as part of our eight-week long MuseumWorks program. And some students chose to serve as paid museum receptionists where they welcome visitors. The museum also extends a warm welcome to anyone who wishes to visit and see our permanent collection, special exhibits, or attend one of our public programs. Our museum is free to everyone, completely handicap accessible, and near to ample free parking. Just check our open hours online and come visit.